Politicians are busy these days trying to fix deficits, trying to close the gap between what government spends and what it takes in. It’s a difficult task, but it is assumed that in the long run some combination of spending cuts and tax increases will bring us to balanced budgets. If that day ever arrives, the politicians will toast each other for their maturity and leadership, and assume that the country’s fiscal problems have been solved. Unfortunately, this self-congratulation would not be justified. In this balanced budget situation, with taxes fully covering expenditures, there would still be a huge negative number eating at the heart of national finances. This other “deficit” consists of the overhead costs, or waste, in government tax-and-spend systems. Though there is an element of redistribution in many spending programs, basically government is taxing people and then trying to return the money to them as some benefit they could have bought for themselves, such as education, housing, art, pensions, medical care, and so on. This cycling of funds through government involves enormous waste. My estimate of this loss puts it at $5.7 trillion. For example, economist Edgar Browning has taught and researched in the field of public economics for decades. In 2008 he produced a book, Stealing from Each Other, which reviewed some of the overhead costs involved in social welfare spending and the taxes that finance it. This book has an Amazon sales rank of 830,878, which is to say there are nearly a million book titles more popular. The few people who have read it will know that Professor Browning’s estimate of the cumulative waste stemming from welfare state transfers is not a trivial number. He estimates that this waste lowers the U.S. gross domestic product (GDP) by $4 trillion. It is clear, then, that people who believe that the overhead costs of government activities are low do not know this for a fact. Instead they are making a blind assumption, supposing that government is an efficient machine for directing society’s resources. In Six Political Illusions I call this belief the illusion of the frictionless State. Explaining this deeply rooted bias would take us rather far afield, into realms of psychology and even theology. In summary we can say that human beings are apparently disposed to believe in a higher power capable of managing society and fixing its problems, and this leads them to thoughtlessly attribute special powers and capacities to government. One of these special powers is the ability to transfer resources without significant overhead cost. 3. Overconsumption costs. When government offers services below their economic cost, people “consume” more than they need and would be willing to pay for. This problem is especially acute when a subsidy is delivered as a producer-controlled giveaway. Medicare is an example. Since doctors are largely making the decisions and they know their patients are not paying, they can load up the bill with marginally important services. For example, in one case I know of, a consumer paying his own way arranged with his doctor for a hip replacement operation that cost $15,000. When the same operation was being paid for by Medicare, the patient and his doctor accepted extras that brought the bill to $45,000. The pattern of overconsumption in subsidized medical care was documented in a social experiment by the RAND Corporation in the early 1980s. It found that making medical care free produced an overconsumption rate of 44 percent compared to those paying their own way—with no difference in health benefits for the average participant. The better way to deal with this unknown is to make preliminary estimates, and then refine them with subsequent research. In the case of these overhead costs of disbursement, a useful first estimate can be achieved by proposing plausible figures for the range of each cost and taking the midpoint of each. My effort along these lines is given in Table 1. 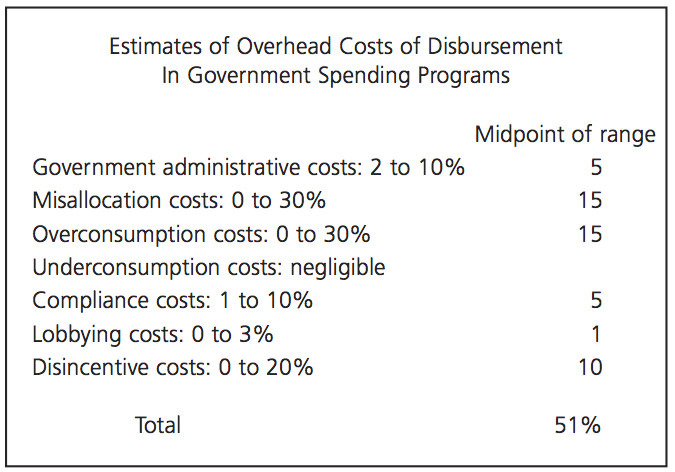 The total, 51 percent, is a preliminary estimate of the average disbursement cost. For those who wish to criticize this number as being either too high or too low, I say: Be my guest! It’s high time that policy analysts and budget writers started making estimates of this number. To calculate how much this waste costs the country overall, we need to apply it to government spending at all levels. From this total figure I have subtracted spending for core government functions—defense, foreign policy, courts, police—on the grounds that only government can provide these services. These programs may involve huge amounts of waste, but abandoning them isn’t considered an option. All other government services— education, scientific research, pensions, health care, charity, arts, roads—can be and are provided through voluntary, free-market systems, so a realistic and less wasteful way of providing the activity is available. Total non-core spending for federal, state, and local governments combined was $4.9 trillion in 2009–10. Applying the 116 percent factor to this number gives us a waste figure of $5.7 trillion. That is the yearly economic loss the country suffers owing to its decision to supply consumer goods and services through government.